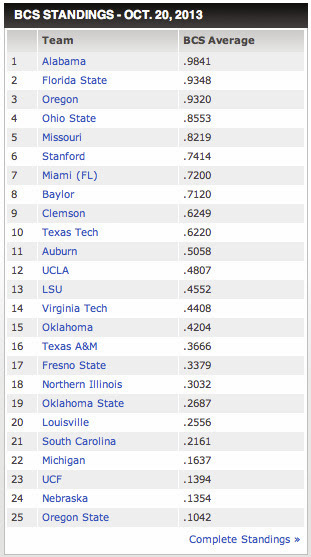 The first of the final BCS rankings were released last night with some surprises and some not-so-surprises. Click below to see the rankings! No one is shocked that Alabama continues to live in the #1 spot but a mild shock as Florida State occupies the second spot after their drubbing of Clemson. Also surprising the Missouri Tigers who enter the poll at #5 after no top 10 votes to start the regular season. Who surprises you most and least? Let us know! Ohio State at #4 and Oregon at #3, displaced by Florida State, round out the top five.